It’s no secret that climate change is driving us towards searching for more sustainable sources and doing what we can to reduce our carbon footprint. From electric cars to compressed aerosols; the things we use every day are being rejuvenated with the planet’s wellbeing in mind. As Suzanne Lee, founder of BioCouture, points out in a TED talk detailing her practice; BioCouture is not about replacement of current materials but a suggestion for an additional option that works to protect precious natural resources. 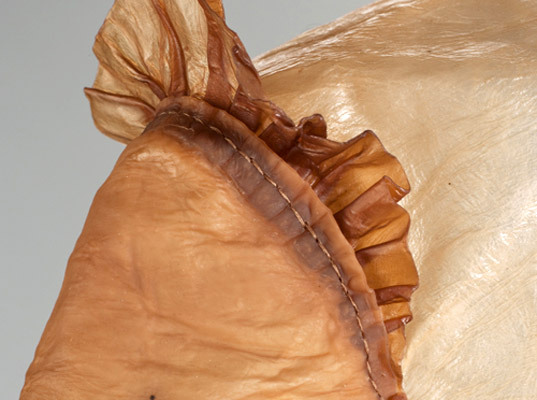 BioCouture is a design consultancy making developments that bring together science and fashion with the creation of fabrics using living organisms such as bacteria and yeast: making use of what would usually be disregarded as waste product. Using scientific processes the material can be dyed, embellished with pattern and moulded around a three-dimensional shape to form garments. There is even the possibility of growing leather using animal cells rather than taking the life of an animal; something that would undoubtedly revolutionise the use of leather and address issues attached to it today. Whereas many in the industry look ahead in terms of oncoming seasons, Suzanne has stepped back to consider the fundamental aspects of what our clothes are made from and in turn is creating innovative and infinite possibilities for the future.